Weight Training With Dumbells: Advice, Routines, etc. 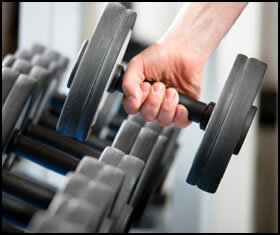 Weight training with dumbells can be incredibly rewarding, for strength and overall health. With the right advice and a good routine you'll be building tons of strength, and not be hurting yourself! Dumbells are excellent free weights to train with. They stress your stabilizer muscles, unlike machines that support your body. Along with barbells, dumbells are some of the best exercise equipment around. Simply put, they build strength better than many machines - and if you work them then they'll work for you. Every gym I've ever been to has them, even crappy travel gyms in hotels. Literally, you can find them at any gym - so you'll always be able to do weight training with dumbells. No excuses! Even if the place doesn't have the latest machines, they will have dumbells. And if not, you REALLY don't want to be there in the first place. You want to get strong? Make your weight training with dumbells count by using HEAVY DUMBELLS. This appears obvious, but really stretch yourself to lift heavier and heavier weights every time (safely, of course). Unless you have that fire and drive to constantly lift heavier and heavier weights, you won't get results. No matter if you're weight training with free weights, dumbells, kettlebells, machines, or rocks. Don't get lazy! Machines have some benefits, and are useful for rehabilitation and working on specific weak spots. But that is also their weakness - theyonly work specific parts of your body. When weight training with dumbells your stabilizer muscles work hard to, well, stabilize your body throughout the movement. Doing a standing, overhead press with dumbells means that you have to keep your whole body tight and balanced while lifting. You work you abs, back, and legs (to a lesser extent) keeping your body in position this way. And if you don't stabilize you'll fall over, drop the dumbbells, and possibly hurt yourself. It puts more overall strain on your body. And if you need to use your strength outside the gym (moving boxes, pushing your car to start it, carrying furniture, etc.) your natural movements will be more like lifting dumbells and less like moving weight in a machined groove. Make sense? More than any other kind of weight training with free weights, dumbells give you the chance to move them around. You can do swings, clean and presses with one or both hands, and many more different kinds of full body movements. The variety of exercises that you can do with dumbells is almost unmatched. Try new movements and use odd angles (ex: 2 handed swing of heavy dumbell from lower left to upper right, working your core) since these tools give you so much versatility! You've got your whole life to get strong. Be enthused, have that burning fire in your belly when you're training, but don't hurt yourself. Continuing to come back to the gym to train for weeks, months, and even years takes uncommon dedication. Uncommon, but definitely not impossible - if you want it bad enough! Enjoy it, but don't hurt yourself and/or burn yourself out in the beginning. There are tons of great dumbell routines, but I recommend this one as one of the best weight lifting program for beginners. It can be done with either dumbells or barbells, and it introduces you to basic, big-body-movement exercises. So, feel that fire in your belly and pick up those dumbells! They are simple, handy, and ludicrously effective for building useful strength. • Click here to leave 'Weight Training with Dumbells' & go back to the Home-page!